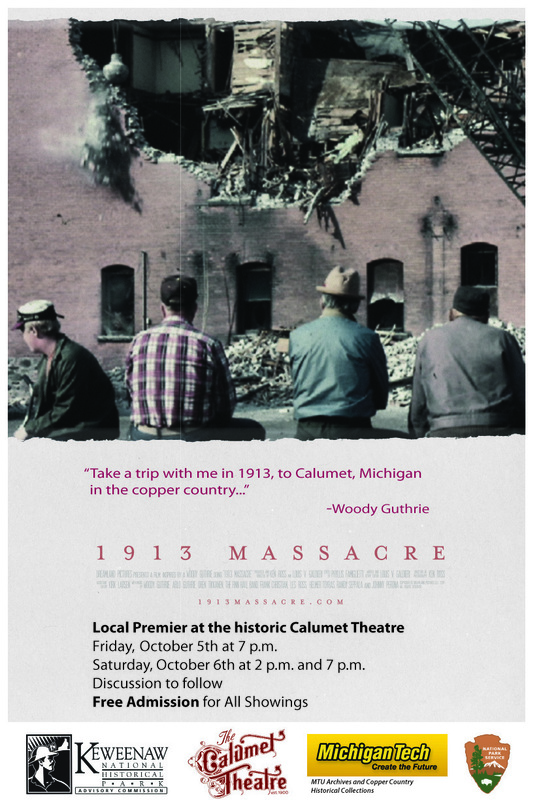 (Calumet, MI) Following numerous trips from New York City to Calumet, and spending several years in the editing room, filmmakers Louis Galdieri and Ken Ross are returning to Upper Michigan’s Copper Country to show their now-finished film, 1913 Massacre, in Calumet. Inspired by the famed Woody Guthrie song of the same name, Galdieri and Ross capture the thoughts and feelings of the last living witnesses to the disaster, as well as those of descendants and Calumet residents at-large. The film’s local premier will be held at the historic Calumet Theatre on Friday, October 5 at 7:00pm, and on Saturday, October 6 at 2:00pm and 7:00pm. A question and answer period, and an opportunity for open discussion with the filmmakers will follow each showing. The screenings are free and open to the public, courtesy of the Keweenaw National Historical Park Advisory Commission. The film is currently touring at film festivals around the country and has been featured in celebrations of Woody Guthrie’s 100th birthday. The filmmakers hope to bring the film to television audiences in the Great Lakes Region and across the country to mark the 100th anniversary of the Italian Hall disaster in 2013. For more information, and to watch a trailer for the film, visit www.1913massacre.com. The tragedy was a landmark event for Calumet and the national labor movement. As such, and in the spirit of providing multiple perspectives to the American public, the National Park Service and the Keweenaw NHP Advisory Commission provided support for the film, but did not direct the content of the film. While lauding the work of the filmmakers and acknowledging the collaborative manner in which they worked, the NPS and the Commission do not endorse the filmmakers over others pursuing similar projects. They present this film to the community for its consideration, personal interpretation, and preservation of the Copper Country’s mining heritage. For more information contact Keweenaw NHP at 906-337-3168 or 483-3167, or contact the Calumet Theatre box office at 906-337-2610. About the filmmakers: Ken Ross is an award-winning director and cinematographer. His projects range from documentaries and independent experimental films to commercials, music videos and TV shows. His work has appeared on ABC, HBO, Lifetime, Nickelodeon, and PBS. Louis V. Galdieri has directed film and video shoots and hundreds of interviews around the world. He has written both short and long format films and collaborated and consulted on a variety of film projects, from story development to post-production, from documentary to feature.